If you are trying to make a gluten free pie crust and find yourself with few ingredients, or want to make a gluten free pie crust with a whole grain flour and no xantham gum, try this one.... I used brown rice instead of wild rice and didn’t use any sweetener. My oven may not be the same as yours because I had to cook a little longer for a crispier crust before flipping. I will be making this again! 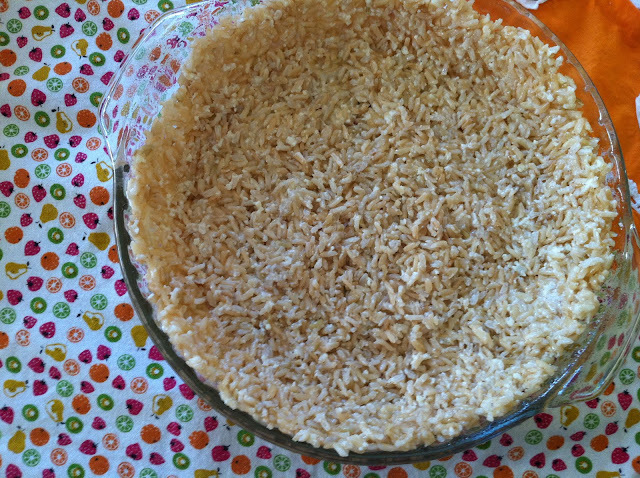 5 Spoon the rice into a pie plate and press down to form a crust. The rice should be just warm or room temperature but not cold, which will make it more pliable and easy to work with.... 15/08/2012 · I have always loved to make my own pizza crust. I think I finally convinced my husband to date me years ago by inviting him over on numerous occasions for homemade pizza. I used brown rice instead of wild rice and didn’t use any sweetener. My oven may not be the same as yours because I had to cook a little longer for a crispier crust before flipping. I will be making this again!... I used brown rice instead of wild rice and didn’t use any sweetener. My oven may not be the same as yours because I had to cook a little longer for a crispier crust before flipping. I will be making this again! Preheat oven to 350°F. Place rice flour in bowl of a food processor. Add margarine, 1 tablespoon at a time and pulse to combine. Mixture should look crumbly.... This 2-Ingredient Quinoa Crust is both a naturally gluten free pie crust and a naturally vegan pie crust. It serves amazing as quiche crust and if made flat even as quinoa pizza crust. 15/08/2012 · I have always loved to make my own pizza crust. I think I finally convinced my husband to date me years ago by inviting him over on numerous occasions for homemade pizza. 1/01/2010 · To make the crust, combine rice and stock in a medium saucepan and bring to the boil. Reduce heat to low, cover and simmer for 35 minutes or until tender and liquid has been absorbed. Directions. Preheat oven to 350°F (180°C). Spray a 9-inch (22.5 cm) pie pan with cooking spray. To make the brown rice crust, mix rice and egg white in a medium bowl by hand. Mix the rice, finely grated cheese and one egg in a bowl. Press the rice mixture into a pie plate, about 1/4 inch thick. Bake in a preheated 450 degree F oven until the edges and bottom just start turning golden brown, about 5 to 7 minutes.